Would you like more practice using the 7 Steps to Reprogramming Yourself after taking the online class or attending the Live Course? Some of our graduates have said that practicing with clearing partners has really helped change their life faster, and helped their confidence in using the 7 Steps. Practice can lead you from having knowledge of the 7 Steps to having full mastery of it! 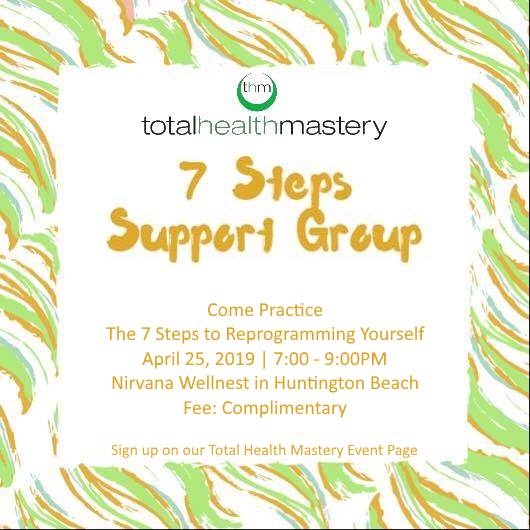 We are having our first Total Health Mastery 7 Steps Support Group gathering Thursday night, April 25th at 7pm! The clearing clinic will be hosted by Nirvana Wellnest in Huntington Beach. If you have any uncertainty in using the 7 Steps, if you are not sure what to clear regarding your past trauma, blockages to your life goals, or questions on how to coach others, this event is for you! By the way… the cost is… zero! For now. See you on Thursday night the 25th at 7pm! This is for graduates of The 7 Steps to Reprogramming Yourself (Online or Live) only. This is your opportunity to practice, be encouraged, help others ask questions and transform your life even further! Location: Nirvana Wellnest – 17682 Beach Blvd # 102, Huntington Beach, CA. For more information please call 877-680-8200 or visit our Facebook Event page.